Armenia’s acting Prime Minister Nikol Pashinyan looks set to consolidate his authority after Sunday’s snap election, as early results show his electoral bloc in the lead. Mr Pashinyan, a journalist turned politician, spearheaded a peaceful revolution in the country in April. He needs a parliamentary majority to push through his anti-corruption campaign, and reforms to Armenia’s economy. Voter turnout has been low, at 49%. Historically, Armenia’s elections have been marred by fraud and vote-buying, but correspondents say there is hope that this one will be different. International observers from the Organization for Security and Co-operation in Europe are monitoring the process. What is the result so far? Early results from Armenia’s election commission show the centrist My Step Alliance, which includes Mr Pashinyan’s Civil Contract Party, has more than 70% of the vote and will easily win a majority. In second place, the Prosperous Armenia party currently has more than 8%. Led by tycoon and arm-wrestling champion Gagik Tsarukyan, it was part of the ruling coalition in the outgoing parliament. Bright Armenia, a liberal pro-Western party, has about 6% of the vote, the commission said. Each party needs at least 5% of the vote to enter the 101-seat National Assembly, while blocs need 7% or more. Armenia’s constitution states that 30% of seats in parliament must go to opposition parties. Full results are expected later on Monday. What will it mean for Armenia? At a polling station in the capital, Yerevan, voters said they hoped Mr Pashinyan would be able to deliver the ambitious changes he has promised. Analysts say the 43-year-old will hope to keep his promises while staying in the good books of Armenia’s key ally, Russia. A former Soviet state of three million people, Armenia hosts a Russian military base and depends on Moscow for its security. 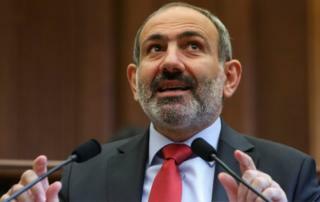 Mr Pashinyan has also said he hopes to “step up co-operation with the United States and European Union”. How have the PM’s critics reacted? The revolution led by Mr Pashinyan ousted the country’s 10-year President Serzh Sargsyan, a member of the Republic Party. He was accused of clinging to power after taking on the newly-enhanced role of prime minister when his term ended. Now senior Republican Party figures have accused Mr Pashinyan of trying to turn Armenia into 1930s Germany, and of becoming a Hitler figure. His critics say his “cult of personality” will weaken multi-party democracy. Armen Ashotyan, vice-president of the Republican Party, complained before the election that “all political parties were deprived of time to prepare well”. He added that he expected “so-called post-revolutionary euphoria” would be reflected at the ballot box.